The old fashioned Irish dessert recipes given below are typical of a country blessed with its rich heritage of fine eating. Unpretentious and absolutely delicious, these desserts from the land of the shamrock are perfect for serving on any occasion. Don't miss adding them to your collection. Barmbrack is a traditional Irish cake bread eaten on holidays and especially on Halloween, when it's also known as Soul Cake. Its name "Barm Brack" comes from the Irish Bairin Breac meaning speckled loaf, referring to the fruit bits or raisins in it. You will sometimes hear it called "Brambrack," though "Barmbrack" is really its more common name. Traditionally a Barmbrack cake recipe calls for objects (lucky ingredients) to be added to the dough before baking, objects that will mean something special in the year ahead for the person receiving the slice. For example, a coin could mean wealth or good fortune, a ring meant marriage, and a dried bean meant possible money worries. However, the risk of breaking a tooth or swallowing a "lucky" object overrides the novelty of including them. Note: 2 cups mixed raisins, sultanas, and currants may be substituted for the mixed dried fruit. Add dried fruit pieces to a bowl, then pour the black tea over them and allow to soak for 3 hours, or overnight is best. Afterwards, drain the fruit of any excess liquid. Add the egg, sugar, lemon marmalade, orange zest, cinnamon, and nutmeg to a large bowel and beat until well mixed, then carefully fold in the fruit and stir until everything is thoroughly combined. Gently fold in the flour and baking soda until just combined, then pour dough into a well-greased cake pan, ring mould, or Bundt pan. The trick in making a good Barmbrack is to not over-mix the dough or the tea-soaked fruit will break apart and lose its rehydrated plumpness. Place in an oven preheated to 350°F (180°C) and bake for about 50 minutes or so. When done, the top of the cake is a light golden brown and springs back when pressed. Remove cake from the oven and let cool at least 60 minutes in the tin before placing onto a wire rack. Allow to cool completely before serving. If desired, when done, glaze the top of your barmbrack cake with 1 tablespoon honey dissolved in 2 tablespoons boiling water, pouring it evenly over the top, then returning the cake to the oven for 2 or 3 minutes to set the glaze. 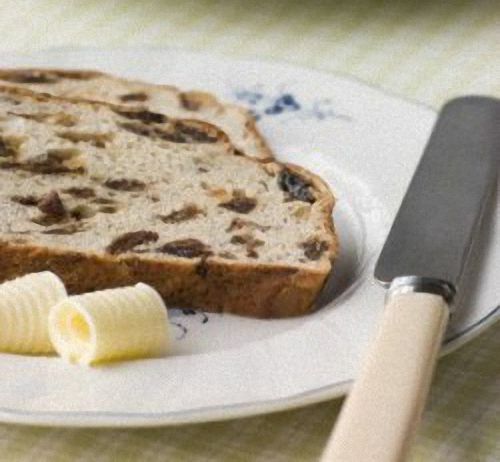 Slices of cold Barmbrack can be served buttered, with freshly whipped cream on the side, or with homemade preserves. Of all the Irish dessert recipes presented here, you owe it to yourself to try making BarmBrack. 8 oz flour, 1 teaspoon baking powder, 4 oz sugar, 4 oz butter, 3 or 4 cooking apples, 1 egg (beaten), milk. Put flour, baking powder and sugar into a mixing bowl. Mix together. Now roughly chop up the butter. Do not cream or rub in. Peel the cooking apples and slice into the mixture, then stir in the beaten egg and sufficient milk to make a fairly stiff batter. This will be quite lumpy with apples and butter, but it is correct. Pour into a greased tin and bake for about an hour in a moderate oven (375°F). These biscuits were often made by Mom. 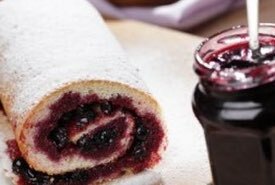 As the recipe says, it goes well with preserves, jam or jelly. Delicious. Boil and mash six or eight potatoes. While warm, lay on a floured pastry board and run the rolling pin over and over them till they are free from lumps. Turn into a bowl, wet with a cup of sweet milk, add a teaspoon of melted butter. When well mixed, work in 1/2 cup flour (salted) or just enough to make a soft dough. Return to the board, roll out quickly and lightly into a thin sheet, and cut into round cakes. Bake in a quick oven. Butter as soon as they are done, laying one on top of the other in a pile. Eat before they fall. The excellence of potato biscuits depends very greatly upon the softness of the dough, light handling, and quick baking. If properly made, they will be found extremely nice. A favorite Irish dish. A dessert in its own right when eaten with preserves. This old fashioned potato candy recipe is the one Mom used for making her wonderful mashed potato candy topped with dark chocolate. I loved it when I was a kid, and I still do. And, it's easily made. 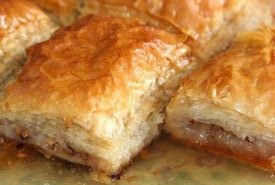 It's hard to believe that such a delicious homemade confection can be created from such an ordinary ingredient as the common potato. Heck, this candy is good even without the chocolate. Just crumble it over a bowl of your favorite ice cream or cereal. But, with the chocolate and some shredded coconut added it somewhat reminded me of a Bounty® bar. If you're wondering what candy made from potatoes tastes like, this is an Irish dessert recipe you simply have to try! You'll love the chocolatey melt-in-your-mouth good taste of this old fashioned confection. And wow, both dark chocolate and potatoes are good for you, so they say! 1 medium-sized potato, boiled and mashed fine; add 2 teaspoons butter, 1/4 pound coconut, 1 teaspoon vanilla, stir in 1 pound confectioners' sugar and beat until creamy. Put down in a buttered pan until hard; make 1 inch thick and pour over it 2 melted squares bitter (dark) chocolate. Put in a cold place for 2 hours and cut in squares to serve. Delicious. 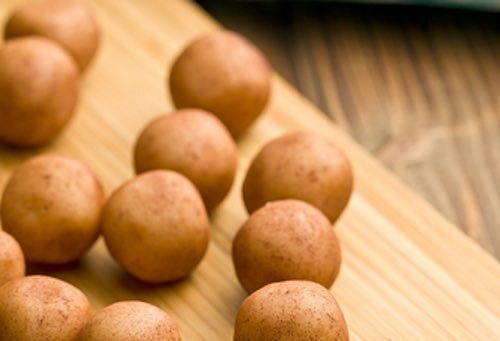 For St. Patrick's Day or as a novelty treat, roll the mashed potato candy mixture (above) by hand into irregular bite-sized balls and then let them dry a while before rolling in cocoa powder to give the appearance of little potatoes. People love them so make lots if you're planning a party. 4 cups graham flour (or 3 cups whole wheat flour and 1 cup bran), 1 cup black molasses, 2 cups sour milk, 2 teaspoons soda, 1 teaspoon salt. Mix and shape dough into a round loaf, place on floured baking sheet; bake at 350°F for more than one hour, until done. Keeps well. 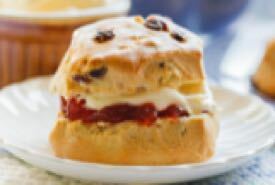 Delicious when served with fresh butter and fruit preserves. One egg, half cup butter, one and half cups buttermilk, two cups Graham flour, one cup sugar, one cup stoned raisins, one saltspoon nutmeg, half teaspoon salt, one teaspoon baking soda. Mix all dry ingredients together. Very good. This is a traditional Irish apple pie that's sure to please. Pare and take out the cores of the apples, cutting each apple into four or eight pieces, according to their size. Lay them neatly in a baking dish, seasoning them with brown sugar and any spice, such as pounded cloves and cinnamon, or grated lemon peel. A little quince marmalade gives a fine flavor to the pie. Add a little water and cover with puff paste. Bake for an hour till done. If you're planning a traditional wedding luncheon, this Irish wedding cake recipe may be just what you want. This makes an excellent Irish fruitcake that's suitable for any occasion. Boil either Irish or sweet potatoes until well done, mash and rub through a sieve; to a pint of pulp, add three pints of sweet milk, tablespoon of melted butter, teacup of sugar, three eggs, pinch of salt, and nutmeg or lemon to flavor. Use rich paste for under crust. Boil 1/2 pint of milk and 3 ounces of butter, stirring to prevent burning. Take off, add 1 pound of whole wheat flour and a pinch of salt, and beat well. Roll out 3/4 inch thick, cut into squares and cook on a griddle, turning often, for 1-1/2 hours. Serve with butter or preserves. Pare and slice apples and lay them in a buttered pie dish. Sprinkle with brown sugar; add the juice and rind of 1/2 of a lemon, a pinch of cinnamon, and cloves. Then cover with a rich pie paste and let bake until done. Take 1 pint of oatmeal; pour on enough cold water to cover; let stand overnight; strain and boil with a pinch of salt until thickened. Then add 1 cup of cooked small fruit, a lump of butter, and sugar to taste. Let get cold and serve with cream. A very traditional Irish dessert recipe. Mix 1/2 pound of sifted flour with 2 beaten eggs, a pinch of salt, a pint of milk, and 1/2 ounce of melted butter. Mix well to a smooth pancake batter and fry in hot lard to a delicate brown. Sprinkle with powdered sugar and serve hot. Whether it's the apple cake, apple pie, potato biscuit, Barmbrack cake, or the extra special Irish wedding cake, you will love eating these old fashioned treats from the land of the shamrock. 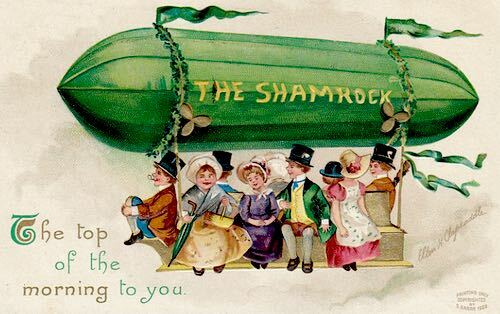 But please don't wait until Saint Patrick's Day. Put on a shamrock-green apron and try one of these authentic Irish dessert recipes today. They are worth more than a pot of gold! No blarney spoken! How about something Irish and fun to serve? See my special collection of St Patrick's Day Recipes that have been adapted from vintage recipes to make them more contemporary for the holiday. 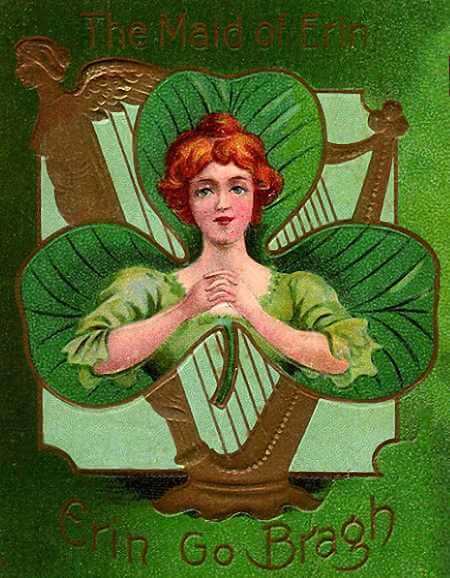 From the traditional Irish whiskey cake, to the always wonderful potato pie dessert, you'll love the authentic lore and Irish dessert recipes featured on Deborah Felker's site at Fantasy-Ireland.com, your online passport to the beautiful Emerald Isle.